Front row, from left: Joe Terlisner, Kenny Mullan and Mike Oettel. Back row, from left: Hunter Scott, Jon Zancanaro and Matt Maier. 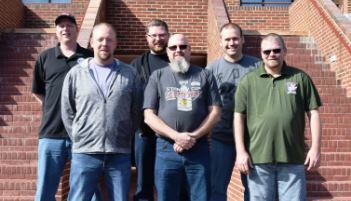 The IAM Local 66 Negotiating Committee, along with a staff member from District 10, recently participated in the Negotiation Preparation for Bargaining Committees program at the William W. Winpisinger Center in Hollywood, MD. The Committee represents employees at Ocean Spray Cranberries in Kenosha, WI, a leading producer of cranberry sauce and juice drinks. The current contract with Ocean Spray Cranberries, Inc. expires March 1, 2017. Recognizing that this promises to be a difficult round of negotiations, the Committee strategized to bring a fair and transparent contract to its members while improving wages and benefits, addressing rising health care costs and securing union jobs for now and into the future. The post W3 Center Prepares Ocean Spray IAM Members for Contract Talks appeared first on IAMAW.